We deliver for all long term bookings – Even 4WD hire in Darwin! No matter where you are located in Australia, we can serve your needs for all 4×4 long term rentals or leasing. Our 4 wheel drive hire rates vary from daily rates to all inclusive prices that are industry leading in value. • We can deliver anywhere in Australia for all long term bookings and have the support of our suppliers having their very own Toyota Dealerships to assist with maintenance needs. • Our dedicated team and good old personal service ensures that our customers are always satisfied. • We continue to grow and expand our range and services to adapt to the ever changing needs of our valued customers. • We have built up long lasting and strong relationships within the Victorian Electricity Industry, Paper Industries, Mining and Exploration Companies, Government Departments, Light and Heavy Industries, Schools and the General Public. • We tailor make our 4WD’s to suit your needs. Extras like Bullbars, Towbars, UHF Radios, Fire Extinguishers, First Aid Kits and Flashing Beacon Lights all come standard at no extra cost. • Our commerical suppliers also have mine approved 4 wheel drive vehicles that have been specifically modified for the mining industry. These include front mount and ceramic coated exhausts, BMA Compliancy, Roll Over Protection (ROPS) and specialised trays and bodies. We also have BMA compliant vehicles. • Our range of 4WD rentals currently in stock include Landcruiser Wagons, Trays and Troop Carriers, as well as AWD Rav4’s and 2WD Klugers- all available for long term hire. Look no further if you need long term 4WD hire in Northern Australia, Victoria, Western Australia, New South Wales, South Australia and Queensland, Tasmania. 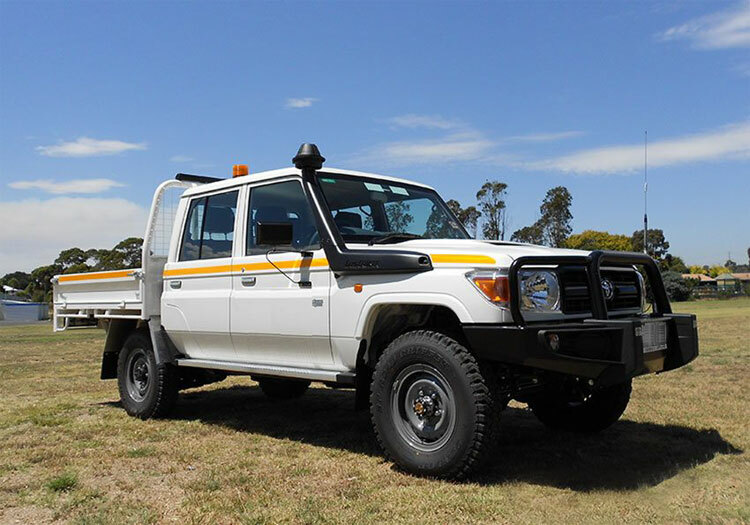 • Our Supplier also have mine approved 4 wheel drive vehicles that have been specifically modified for the mining industry. These include front mount and ceramic coated exhausts, Roll Over Protection (ROPS) and specialised trays and bodies for BMA, Santos, Rio Tinto or Newmont Compliancy. We service many Mining and Construction industries throughout Australia. We have also been providing transportation to local schools and sporting clubs for more than 45 years. • This Supplier is able to deliver to anywhere in Australia for all long term bookings. So why pay too much or hire anywhere else for your 4X4 hire needs? • For all your fleet and leasing needs, call us to discuss the variety of options available to best suit your needs. Our Supplier reckon's, get good old personal country service, no matter where you are.